When comparing folding knives, two of top brands to consider include Benchmade and Spyderco. Although there are many other high-quality knife brands on the market for blade enthusiasts to choose from, these two brands are highly recognized by those familiar with the industry, as well as those who are not. When you purchase a Benchmade or Spyderco knife, regardless of the collection it is from, you know you are buying a premium tool that can be used for multiple applications. Benchmade and Spyderco create some of the most dependable pocket knives for EDC use, outdoor, and tactical use. Benchmade is a knife company that manufactures some of the very best steel blade pocket knives available. Some of the favorites among loyal customers include the SV30 and the Benchmade 940. Both have plenty of useful features and are designed to be a long-lasting, reliable tool. Spyderco knives have been in the knife making business for many years. They create stylish and sophisticated folding knives and fixed blade versions. Spyderco knives are available in a broad range of prices. There are plenty of budget-friendly options to consider, as well as higher-quality knives which are more expensive. When it comes to the Benchmade vs. Spyderco knives debate, there is a lot to consider between these two quality blade manufacturers. It’s important to learn more about each company and the products that they make before you decide which folding knife is right for you. Benchmade began during the latter part of the 1970’s. Since that time the company has expanded and made their mark in the pocket knife industry. Today Benchmade is one of the most popular and respected quality knife companies in the United States. Those who are familiar with premium knives can instantly tell that Benchmade knives are a worthwhile investment. They are made from quality materials and are highly efficient in helping you complete everyday or not-so-common tasks. There are many exceptional knives to choose from when you decide to buy a Benchmade knife. To provide you with a good idea of what you can expect from the company, here are some specifications on some of the most popular Benchmade pocket knives. The Benchmade Fixed Contego is a tactical knife designed by Warren Osborne. This fixed-blade knife features strong lines and a traditional Osborne style. It has excellent tip strength and is a reliable as an all-around general knife. The Fixed Contego is Made in the U.S.A. 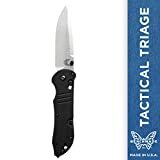 The Benchmade Auto Triage features a premium Austrian steel blade and high-strength aluminum package. It offers the effectiveness of the AXIS Auto opening system and an automatic opening hook for speed and efficiency. This is an authentic Benchmade design Made in the U.S.A. The Auto Triage is available in a Drop-point blade style and an Opposing Bevel blade style. The Benchmade Mini Barrage was the first pocket knife to feature the Axis Assist Technology. These knives have a practical style and are designed for fast, one-handed opening. They are ergonomically designed to be used equally with either the left or right hand. This knife is available in three different versions, one with a Valox Handle, one with a G10/Aluminum Handle, and one featuring a Drop-Point blade style with G10. The Mini Barrage is another Warren Osborne design and it is Made in the U.S.A. The Benchmade Bedlam Knife has a design similar to a scimitar. That is because it was designed originally to be used by security members who worked for a King. This knife is much larger than other popular Benchmade blades. It is also one of the most comfortable to use. The Bedlam is available as a manual or automatic opening knife. 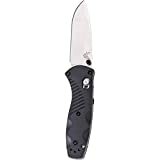 This product is Made in the U.S.A.
Spyderco has been a part of the blade industry since the 1970’s, and they introduced their first folding knife in 1981. From the beginning, collectors could tell that Spyderco had something different to bring to the pocket knife market. Their early designs had innovative features that were very modern at the time and helped to change how knives were manufactured by other brands from that point on. Today the Spyderco Knife Company is well-known in the industry for creating high-quality knives for use in all areas. 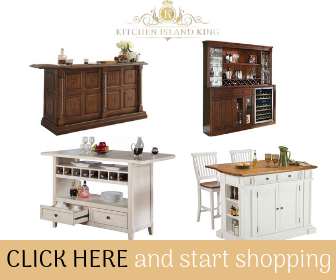 Their products are precision-made using some of the best technology available. 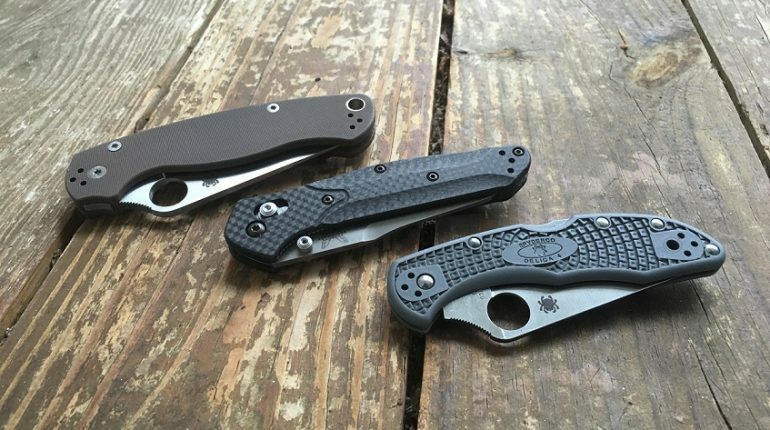 Spyderco creates knives that are available for every type of budget. They offer practical knives for everyday use that are well-made and affordable. 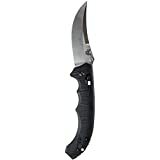 They also have many premium-grade folding and fixed-blade knives that are more expensive and ideal for collectors. Here are the specifications for some of Spyderco’s top-selling folding or fixed-blade knives for you to consider. The Advocate is possibly one of the most recognizable Spyderco knives. It is a production version of the first flipper style folder design knife created by professional knifemaker Gayle Bradley. The Advocate features a precision blade made from CPM M4, which is a high-performance tool steel known for edge holding strength. 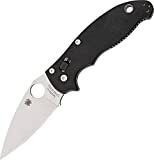 The PlainEdge blade has an index-finger flipper and a fully functional Spyderco Trademark Round Hole, allowing for various one-handed opening methods. The Advocate’s blade is designed to pivot between friction-reducing ball-bearing washes to guarantee the user experiences a high-speed low-drag action during use. The Advocate’s handle features an orange peel design and is made of solid 3-D machined titanium. The design allows the user to have a good grip while the knife is in use. This pocket knife is comfortable to hold and has a stunning appearance that will delight those looking for a collectible knife or one to use daily. The reverse side of the handle features the high-strength Reeve Integral Lock (R.I.L.) mechanism that ensures a secure lock-up while helping to maintain proper spring tension of the lock bar for long-lasting durability. This knife is Made in Taiwan. The Spyderco Proficient Carbon Fiber Knife has the strength and durability of a traditional bushcraft knife, and all the modern benefits of state-of-the-art manufacturing. It is designed by Chris Claycomb of Bushcraft UK who is an expert in wilderness excursions. The Proficient fixed-blade knife has excellent edge retention and cutting performance while it allows you to tackle common bushcraft tasks with ease. Instead of featuring the common Scandinavian grind, this knife has a blade made from CPM S90V vanadium-rich stainless-steel. It has a full-flat grind which allows for low-friction cutting every time you use it. The full-tang handles feature scales for a confident grip, and there is also a lined lanyard hole for easy transport. The Proficient comes with a leather pouch-style sheath so that it may also be carried on your belt. This knife is Made in Taiwan. Full-service folding knife that provides exceptional strength and cutting performance. Made in the USA. The Spyderco Manix is a useful pocket knife that is strong and long-lasting even after years of use. It features an extra-strong lock, and a blade that is honed from superior steel materials. The Manix has a backlock that is positioned mid-spine that allows for smooth opening and closing. The dual steel liners found in the G-10 handle improve the strength of the knife without adding any unnecessary weight. The knife is ideal as an EDC yet can also take on more strenuous tasks. The double flat-ground blade is made from premium S30V steel. And there are thumb serrations notched right above the trademark Spyderco Round Hole. These notches keep the thumb gripped on the blade’s spine to improve cutting accuracy and performance. The Spyderco Manix is available as a PlainEdge or CombinationEdge. It is Made in the U.S.A. in Golden, Colorado. If you want a Spyderco knife that is as stylish as it is functional, the Chaparral Stepped Titanium knife is a good choice for you. This highly-refined gentlemen’s folding knife features a modernized handle made from premium materials. The Spyderco Chaparral Stepped Titanium folding knife is Made in Taiwan. The Spyderco Karahawk is the brand’s folding version of the traditional Karambit of Southeast Asia. This knife has a precision hawkbill blade made from VG-10 stainless steel material. 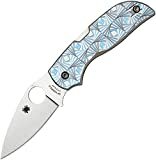 It has the Spyderco Trademark Round Hole and an Emerson Opening feature to guarantee fast and easy opening and closing. 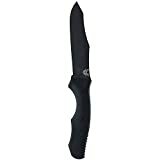 This knife has a strong and secure high-strength back lock mechanism to withstand the strain of defensive use. The handle includes attributes similar to the Karambit and it is just the right size to carry in your pocket. The ring featured on the Karahawk is reinforced with G-10 steel material and its edges are polished to ensure high-speed manipulation. The reversed hourglass style clip allows you to carry the knife tip-up, on either side of the body. It is hard to tell which brand is better when comparing Benchmade and Spyderco knives. But we have come up with a few things for you to consider if you are new to buying high-quality blades. All Benchmade knives are Made in the U.S.A. which can often be a huge deciding factor for many collectors. While there are some Spyderco knives that are made in the U.S., such as the Spyderco Manix, which is made in Golden, Colorado, most of the brand’s knives are made in Taiwan. While some consumers may not care about where their knife was made as long as it is a good quality product, others may prefer that their knife is made in the United States. Both brands have knives that are priced for various budget types. While Spyderco has many pocket knives that are within the $30 to $60 rang, the majority of Benchmade knives are between $120 and $160. Spyderco may have a good selection of affordable knives to choose from, but they also have some premium knives that range between $500 to $2k and up. The debate on which blade company is better, Benchmade vs. Spyderco, really comes down to a matter of opinion. There are pros and cons associated with each company, and if you are an avid knife collector, you will probably decide for yourself which knife company is the best based on your own experience using a Benchmade or a Spyderco product. Regardless of whether you choose a bushcraft style knife like the Spyderco Proficient, or a tactical knife like the Benchmade Fixed Contego, you can be assured that the blade you purchase is a high-quality product made from some of the finest materials in the industry.